In Time is like a cheap Rolex picked up in Battery Park. Don’t count on it working for more than a few minutes. Sometime in the future, genetic engineering has altered the human race and all of the associated socio-economic underpinnings. People stop aging at 25, but they die at 26. Time is a currency that people earn and spend; if one works hard and saves time, one could, theoretically, live forever. Alas, life’s not that easy. A cup of coffee that cost only three minutes yesterday costs four minutes today – it’s a cost of living increase that impacts every second of a person’s lifespan. Making matters worse, a new breed of gangster has arisen, called Minute Men. They’ll “clean your clock” and set you back several years quite literally. At the other end of the spectrum, a new police force has taken hold of the time economy and the Time Keepers make sure all the minutes are properly accounted for and allotted. So what’s a guy like Will Salas (Justin Timberlake, The Social Network) supposed to do when his mother runs out of time (again, quite literally) and dies in his arms? Well, that’s when In Time stops working. It’s an interesting world wherein the young and lovely Olivia Wilde (Tron: Legacy) plays Timberlake’s mother (in reality, he’s three years her senior). But that’s part of the premise: those lucky enough to live past the age of 26 typically start identifying themselves via simple addition, such as “25+3” when they’ve managed to make it all the way to 28. But there are problems with the scenario. When Mom dies in Will’s arms, it’s obviously supposed to be a tear-jerker moment. But don’t think about it. This is one movie that doesn’t hold up to the slightest degree of cross examination. Mom and Will go their separate ways in the morning, with plans to meet up in the evening. Turns out Mom is running dangerously low on time and can’t afford the bus fare to meet her son. It’s a two-hour walk, an amount of time reflected in the bus fare. The bus driver is intransigent and she has no choice but to run for it. And so it is, in a low-light, deserted neighborhood, Will and Mom run to each other’s arms, Will hoping to grab her arm and transfer some time to her life. Instead, she collapses, breathing her last right at the moment of their embrace. It’s a moment that no doubt reads well in the screenplay. But a thought arises: They both exhibited poor time management and their situation could’ve been avoided. The problem is, the story veers into a ridiculous anti-capitalist theme that turns the movie (distributed by major-bucks studio Twentieth Century Fox) into the rallying cry of the Occupy Wall St. crowd. How dare some people accumulate billions of years when people out there are dying? People apply for “time share” loans at not-so-reasonable rates, they gather at the local soup kitchen in hopes of getting some free time. The pseudo-bad guy in this story is Philippe Weis (Vincent Kartheiser, TV’s Mad Men). He’s accumulated an enormous amount of time and he’s pretty stingy with it, not even willing to part with some hours to pay a ransom for his daughter, Sylvia (Amanda Seyfried, Jennifer’s Body), who goes on the lam with Will. Will’s mission is to get some sort of vengeance for his mother’s untimely death. He robs time banks like Robin Hood, taking from the rich and giving to the poor. All the while, Raymond Leon (Cillian Murphy, Batman Begins), a Time Keeper who handles his responsibilities with the same unwavering dedication as Inspector Javert, stays in hot pursuit of Will. While watching In Time, other similar dystopian sci-fi flicks come to mind, THX-1138, Repo Men, Gattaca, RoboCop, and Carre Blanc among them. Gattaca was written and directed by one Andrew Niccol, the same writer/director of In Time. That realization makes In Time an even bigger disappointment. The cast (particularly the leads of Timberlake and Seyfried, along with Wilde’s small role) are on par with Gattaca’s trio of Ethan Hawke, Uma Thurman, and Jude Law. But the story tries too hard to be convincing while ignoring glaring plot holes. 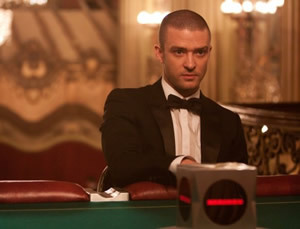 There are deep poker table conversations that take on the same high-stakes intonations of Casino Royale, but of course all of it is spun with “time is money” double entendres. Things that really matter, though, are glossed over, leaving many questions unanswered. How did that surveillance camera catch Will at the scene of an alleged murder but miss the suicide that actually took place at the exact same spot? How did an entire economy shift from a monetary currency to a time currency? Over what time span did such a major transition take place? Did people get to vote on that? It’s the kind of one-note premise, high-level concept art that would work better as a 30-minute short film, providing less time for people to pick apart.